In this article we will knwo that how potentiometer works ,we will also knwo about the types of ptentiometer. 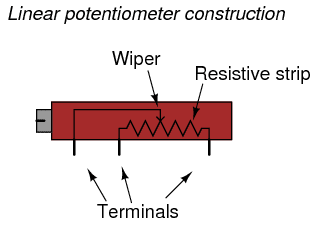 Potentiometer is an instrument for measurement of unknown electromotive force (elf’s) or potential difference (pd) or voltage produced by flow of known current in a network of circuit s of known characteristic. Hence, we can say it is an instrument by which a unknown voltage is measured by comparing it with a known voltage. For better know about how potentiometer works we need to know also about the what is basic advantage of potentiometer. 2. No power consumption from the circuit. 3. Determination of voltage is quite independent of the source resistance. For knowing how potentiometer works we need to must know of principle of potentiometer. It works on the principle of opposing the unknown EMF by known emf with the negative terminals of the two emfs connected together and also positive terminals connected together through a galvanometer. These are also main point of how potentiometer works because we need to must know about which type potentiometer we are using in that time. Basically potentiometer classified in two types. It is a dc potentiometer in which high precision could be obtained without the use of long slide wire by adding is extensions coils, each equal in residence to the whole of slide wire. These are also main types of potentomer which must need to know for understand how potentiometer works. The potentiometer circuit is so designed that in whatever range if operate, current drawn from the battery remains the same and therefore, there is no need of readjustment. There are two main advantages of having low ranges for measurement of small voltages. a. the precision of reading is increased by one decimal place. b. A greater part of the reading is made on the dial resistors which have inherently greater accuracy than slide wire. The advantages of Crompton potentiometer are overcome in varies potentiometer. The remain potentiometer use there measuring dials to include second measuring range of lower value and therefore is also known as; duo range potentiometer. It makes use of kelvin in valley slide principle between the course and intermediate dials. This extends the reading accuracy by further decimal place. Where circuit condition are so unsteady that the voltage under measurement varies, than it becomes very difficult or even impossible to obtain a balance. At the same time, for the measurement of moderate precision, exact balancing is time consuming and tedious. Brooks’s deflection potentiometer was developed to take care of this limitation. It is used for application where the voltage to be measured is continuously changing. In brooks deflection potentiometer, an approximated balance is obtained and greater portion of voltage is reading from the setting of slide contacts. The remaining varying portion is measured from the deflection of galvanometer. A self-balancing potentiometer helps in continuous measurement in non-electrical quantity and hence eliminates the constant attention operator. It is used in industry. In addition to its balancing feature it dras a curve of the quantity bogging measured with the help of recording mechanism. In a self-balancing potentiometer, the unbalance emf is applied to AC anokufuer via converter. Winding of an AC servomotor. This drives the motor to more the potentiometer slider to balance. AC potentiometer works on the same principle as DC potentiometer except that in |AC potentiometer both magnitude and phase of the unknown emf must be same to obtain balance . 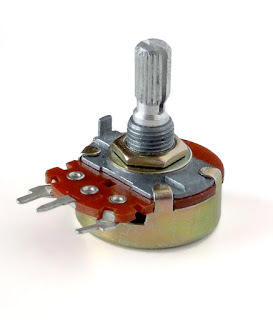 Also known as “dry sale polar potentiometer “, it measures the unknown emf in polar from. In terms of its magnitude and relative phase. In this potentiometer, unknown emf is balanced by means of a single voltage which is continuously variable in both magnitude and phase. Also known as “ gall tinsley potentiometer”. It measures unkown emf in terms of its rectangular coordinates. In this potentiometer, balance is obtained in terms of two voltages which are in quadrature each of these voltages is varied in magnitude and means is usually provided to adjust or check the quadrature phase relation.. hence these are also main type potentiometer which need study for knowing how potentiometer works. The standardization is done with the help of DC source that is standard cell or a zener source and a transfer instrument ( usually a electrodynamometer type mili ammeter), it is so constructed that its response to alternating current is the same as its DC response. Hence from these we can understand that how potentiometer works. If you will find any incorrect above article you must comment below in comment box. For knowing more about how potentiometer works you must watch this video.